A cold-light transilluminator designed to quickly and safely find veins in very low birth-weight neonates. The Pediascan® Model 500 is a cordless, handheld cold-light fiberoptic transilluminator that is designed with a variable intensity rotary dial to ensure the healthcare professional has the optimum contrast between veins and organs and the surrounding tissue. The Model 500 is capable of quickly and safely finding veins and for other transillumination procedures. As with all of our other models, the brilliant white light is peaked in the light spectrum for best contrast with the human eye. Each unit is built by hand in the United States of America. Mil-Spec rubber feet and stainless steel screws. 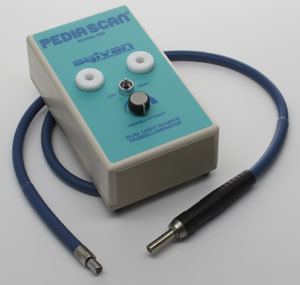 Each new Pediascan® Model 500 purchased include a K913 Battery Charger, a P101 Fiberoptic Lightpipe, and an Owners’ Manual / Service Manual. Request a quotation for the Pediascan® Model 500 neonatal transilluminator or contact us for more details.